Fun to observe what sells in my booth. This last weekend it was all about blue. So I had a bit of time this week to re-stock before I head to Idaho. Seahawks colors have been popular! Imagine you are a painter. You are sitting in your studio surrounded by your paints and brushes, creating a beautiful masterpiece in a serene setting. Or better yet you are working plein-aire sitting outside in the landscape you are painting. Now imagine you have just 3 minutes to create that masterpiece! And the surface you are working on has curves and bumps and is on a wiggly child! That is the world of face Painter Melissa of Happy Go Lucky face painting and henna. Melissa has been adorning bodies with art since 1999. She offers both face painting and henna tattoos. And it is not just for kids, adults enjoy her work too. I came across Melissa at the Lavender Faire in Sequim. You can find her at various events across the state or you can even hire her for your very own party. Check out her Facebook page for additional information and to see many examples of her work. She also creates fantastical head pieces for any occasions... from fascinators, to headbands and headdresses. Custom orders welcome! Check out her Bohemian Fairy website for more information. This week I worked with the last of my supply of 30x30mm square outback wood jasper. These have been so popular. The matte finish maskes them feel wonderful. Like a worry stone, I think you'd be rubbing it all day long! If you see something below that you like please contact me ASAP as I do not expect these to last through mid-August. Even the small stones remind me of miniature landscapes. I will be sorry to see these go. The bracelets are a mix of oval, coin and 12x12mm square outback wood jasper. Pewter toggle clasp and accents with matte black glass beads. Double strand of matte black seed beads with pewter accents. All silver ear wires are copper filled sterling. Necklace and stone earrings have been SOLD. All 4 earrings have been SOLD. Copper filled sterling or copper.The first and third earrings have been SOLD. Copper toggle clasps, copper accents and dark brown glass seed beads. Both of these (above and below) are rich brown matte glass seed seed beads and copper. These last 4 (above and 3 below) are a very dark brown glass seed bead mixed with copper. Both bracelets have been SOLD. 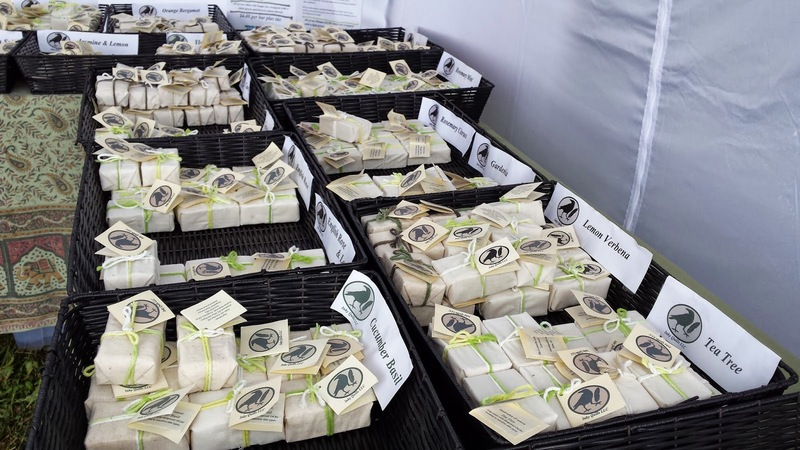 Another of my great neighbors at Olympic Lavender Farm was Inky Quills LLC - maker of natural, eco-friendly, cold process soaps for all skin types. I love homemade soaps and can not wait to try out my purchases. Once you have tried homemade soaps you will never go back to the commerical brands! Chris makes her soaps using avocado, hempseed, and olive oils. Also offered are lip balms and lotion bars. You can see a partial listing of products and make a purchase on their website. You will find Inky Quills LLC at both the Saturday Poulsbo and Thursday night Bremerton Farmers markets. Check out their Facebook page for a fun set of photos showing the soap making process! 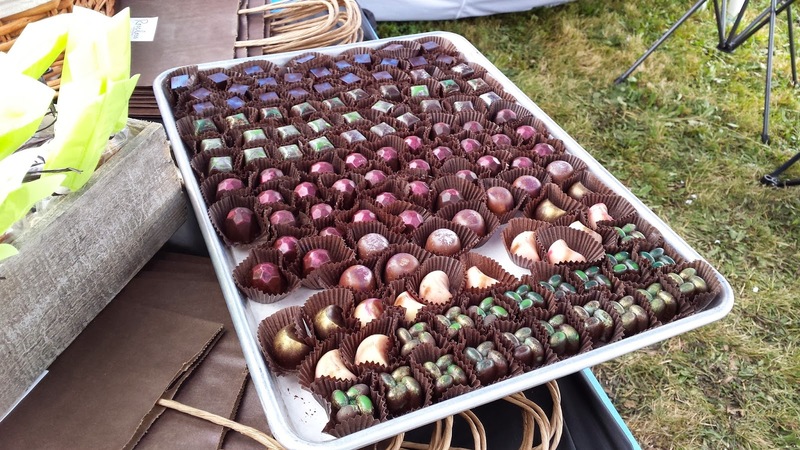 One of my neighbors at Olympic Lavender Farm was Restless Chocolates, a small artisanal chocolate company from Seattle, WA. Yum!! The owner, Hilary, has been making chocolates for years and just last year went into business. She creates flavor combinations that can't be found elsewhere. She focuses on experimentation as well as innovation. My favorite sweet from the weekend was their fizzy lemon drops. They tickle your tongue and make you giggle! 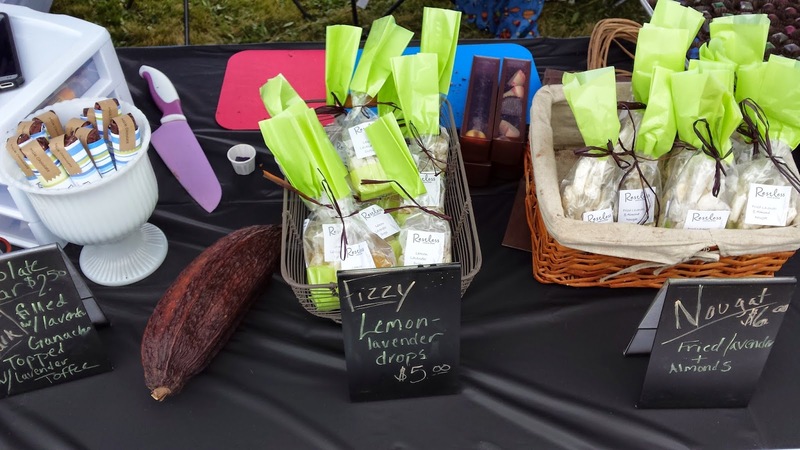 If you'd like to sample some of their tasty confections the next opportunity is this Saturday at the Gig Harbor Wine and Food Festival. You can also purchase their chocolates at the West Seattle Thriftway and the Chocolate Box on 1st and Pike in Seattle. This weekend I will be at Olympic Lavender Farm in Sequim during Lavender Faire. I always stock up on my purple for this show. This week it was Amethyst. Amethyst is a variety of quartz. The purple color is due to its iron content. Note all of these pieces have been SOLD! and is used to celebrate the 4th and 6th years of marriage. Amethyst becomes paler if kept out in sun. Clean with warm, soapy water and a soft bristle brush. Keep away from strong chemicals and avoid sudden temperature changes. Healing ability: Amethyst magnifies psychic abilities and right-brain activity. It strengthens immunity, while energizing and purifying the blood. Amethyst relieves headaches, improves blood sugar imbalance. Mystical power: Given as a symbol of sincerity, security, and peace of mind. Cures impatience, balance high-energy, eliminate chaos, promote clarity, and help keeps one grounded. Activates and balances the 6th chakra (third eye). Ancient folk believed it protects against drunkenness. As the myth goes, drinking wine from an Amethyst goblet would prevent one from becoming inebriated. The gemstone still symbolizes sobriety. Associated with a number of superstitions, being regarded as a love charm, and protection against thieves. Placed under the pillow at night, the beautiful amethyst is believed to produce a calm and peaceful sleep. Note: this information is for curiosity only and is not meant to be medical advice. A few things off my work bench this week that you will find in my booth at the Choochokam Arts festival in Langley WA this weekend. My pictures are blue again! I must have mistakenly changed a camera setting. It really messes up the color of the amethyst necklaces. I will work on that for the next batch. Turquoise and Copper. Bracelet on the right has been SOLD. The earrings on the left and the right have been sold. The earrings in the center have been sold. These are both amethyst. The one below is choker length. I am starting to stock up on purple for the Lavender Faire! Both of these necklaces have been SOLD. I am continuing with this gorgeous series. A few mixed with turquoise. The patterns on these reminds me of the southwest. Findings are either pewter or copper. Both earrings have been SOLD. These two are mixed with Iron Zebra Jasper rondelles and copper. This series has been very popular so if you see one that speaks to you, send me an email so I can set it aside for you. The bottom necklace and earrings have been SOLD.